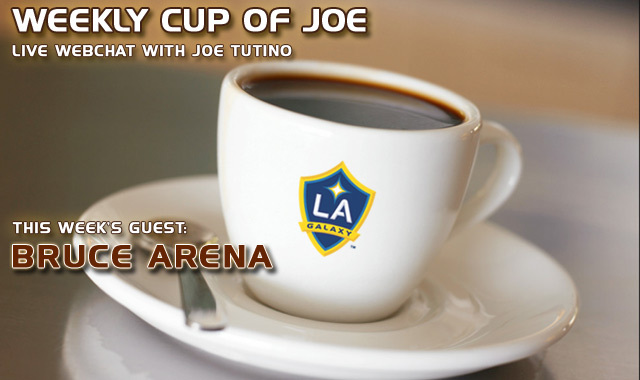 Tune-in to the Galaxy's weekly live web show, Cup of Joe, with radio play-by-play announcer Joe Tutino every Wednesday. Today, Tutino will be interviewing Head Coach Bruce Arena at 11 a.m. (45 minutes prior to the start of today's UEFA Champions League games). 45 minutes before the UEFA Champions League games...5 hours before I have to be at work...anyone else have any arbitrary times throughout the course of the day that this coincides with? ...we're not in Europe...for the love of God get off their Testies. Sure it was great though.